At this point you’ve heard that you should “eat more fish“- specifically salmon because it is high in omega 3‘s and other nutrients like B vitamins, selenium and zinc, while low in saturated fat. But let’s get a little deeper- should you “get wild” or “go for the farmed”? As a consumer, I see the biggest difference between the two is really the price (wild is twice the price, hello! ), but as a Registered Dietitian Nutritionist — I see the potential differences in quality, nutrient content and sustainability too. While I can go into the great debate between wild vs. farm raised salmon, here are some key differences between the two… Wild salmon is leaner, meaning it is lower in fat and calories (about 140 calories less per ~3.5 oz serving- which is significant! )- this is because (for the most part) they are running free in the ocean, getting more exercise than their farmed counterparts and eating more natural/less caloric food sources (smaller fish, algae..). Farm raised salmon on the other hand, are raised in closed quarters outside of their natural habitat. This means that 1- they aren’t getting as much exercise as the wild guys and 2- instead of consuming natural foods (fish, algae…) they are fed more caloric, man-made protein pellets, — both of which will lead to fattier fish (and more caloric for us to eat) but also more omega 3’s than the wild varieties. Also, since, farmed fish get less exercise their flesh often turns grey so pink coloring is added to their feed to maintain their pink color (not au natural, but doesn’t necessarily counteract the benefits of eating salmon!). To complicate things further, some wild salmon are farm raised for part of their lives and then let into the “wild”– which you wouldn’t know without asking a fish monger. Also, depending on how your fish is raised there are concerns about sustainability practices, water pollution, all of which may matter to you. Have I confused you quite yet? Truth is it is a complicated matter and you can learn more about wild vs. farmed fish in this very dense article to help you make a decision that’s right for you! 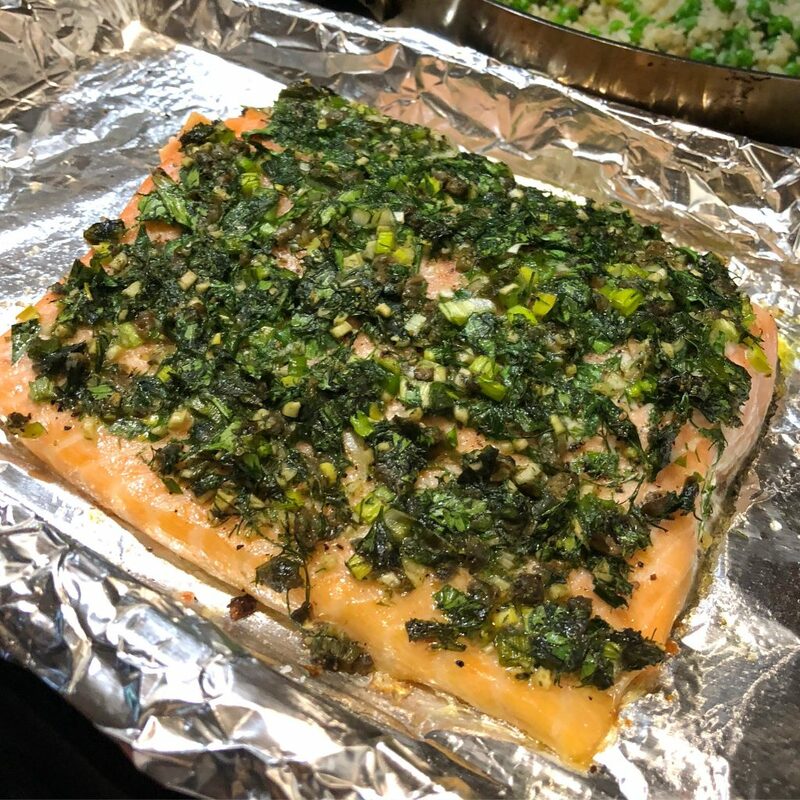 Bottom line is this- both wild and farm raised salmon are nutrient dense protein source with high levels of omega 3’s, selenium, zinc, and others- so either is a go! I mean, you gotta eat something, amiright? In general follow the recommendation to include seafood in your diet twice a week (8 oz total per week)- salmon or otherwise– and note that this recommendation varies for pregnant and lactating women. *Sabzi- in Farsi, this means fresh herbs, which is what makes this recipe a win! Note: Side dish picture is a simple stir fry: I sauteed 1 1/2 cups cauliflower rice and 3/4 cup peas (used frozen for both), 1 scallion, salt and pepper to taste. It cooks in about 10 minutes! 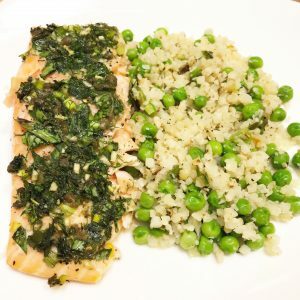 2 Comments on "Get Wild or Farmed: Sabzi Salmon Recipe"
Looks delicious, can’t wait to try it! With recipes, tips and acrobatic tricks. Summer Zoodle Salad: Get. It. Now. طراحی سایت on Summer Zoodle Salad: Get. It. Now.